As a follow up on the Rotational Grazing post I did recently, I figured I would do a post regarding the shelters we are using. 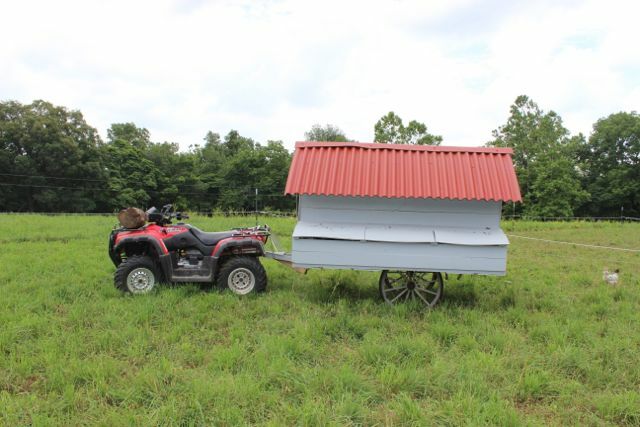 First, we needed a layer coop. 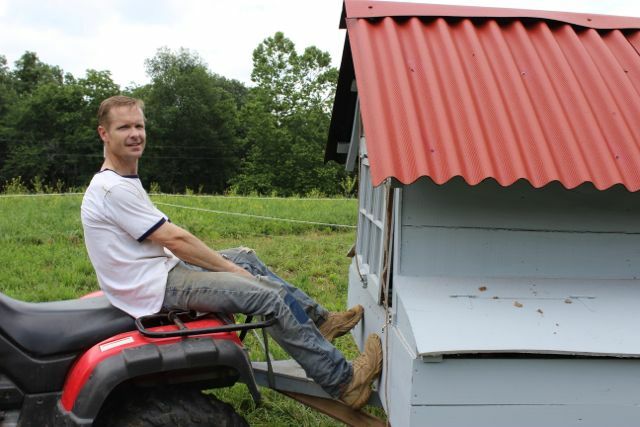 There are lots of ideas regarding portable chicken coops out there, so that one wasn’t too difficult. The greater difficulty was building it cheaply, using as many already-owned supplies as we could. S succeeded in using the wood and the wagon wheels, though we did have to purchase lightweight roofing (wood would have made it too heavy). 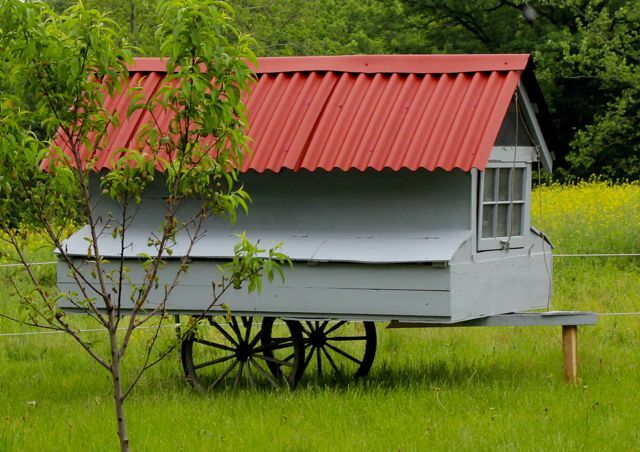 After the coop was built, it wound up a bit too heavy for one person to move alone. Since I have to move it every 2 days right now, with plans to move it daily in the future, we decided to utilize our 4 wheeler for the time being. 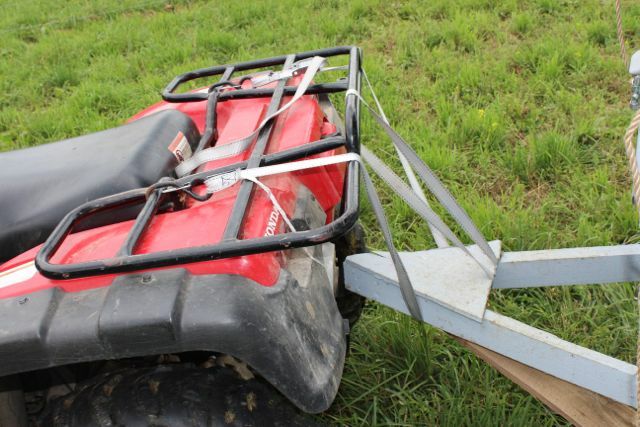 I simply lift the front, and cargo strap it to the ATV. Strapped in this fashion makes pulling quite simple. Braking, on the other hand, is a problem, especially when you consider that our pasture is one big rolling hill. So, I had to find a brake system to keep the coop from running into the ATV. All I needed was a willing party and 2 strong legs. Don’t laugh. It works quite well, thank you! JR usually does this job for me, but S helped me on this particular day. With gas and brakes working, we can now move with no problem. As a side note, the coop is still far too heavy for my liking. As a result, we are hoping to reconstruct the floor, and change it from it’s current wood plank construction to 2×3’s and welded wire. I think it will reduce the weight significantly. It will likely be a while before I get to that project though, so for now, I will continue using the ATV. The other shelter was a bit more of a problem for us. Again, we wanted to use as many already-owned supplies as we could. We still haven’t come up with a design we like, but what we currently have is a hoop house, re-designed out of our hay-shelter supplies from our Colorado home. 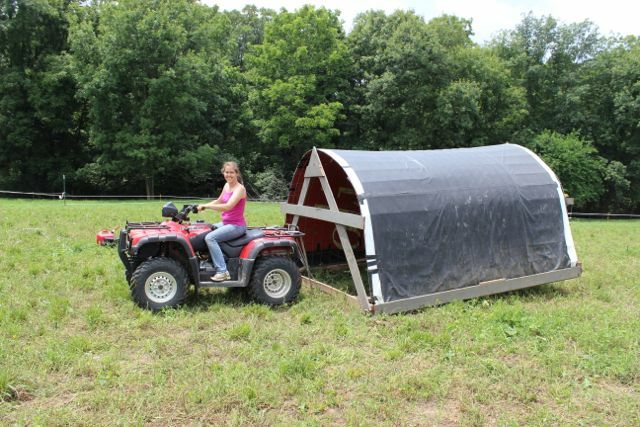 If you study hoop houses, you will quickly see that when intended for anything other than poultry, they must be sturdy enough for animals to lean on and push against. 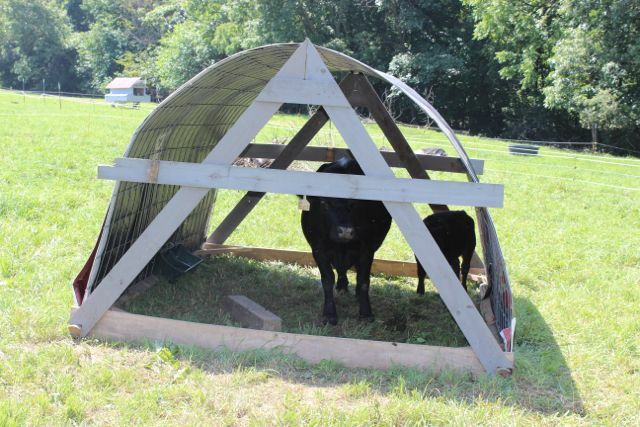 Cattle panel hoop houses make a great, very strong house–assuming the ends are reinforced somehow. Otherwise, the panels can potentially collapse and fold up. We learned the hard way, when our first windy day came along. Most people use t-posts to reinforce when the shelter is intended to be stationary, but ours was to be portable and built on skids, so we needed another plan. S put his engineering brain to work and decided to reinforce with a wood A-frame, attached to the panels with screws, fence staples, and hooks. Since it was intended only for goats originally, he put the center cross beam as low as he could for support. The cows took over the goat shelter. I don’t even know how that mama cow fit in there, but the goats are NOT happy about it!! The downside of this design is that only short animals can fit in there. Somehow, our donkey and cows managed to get in, but I suspect they will eventually break down that center support scraping under it like they do. 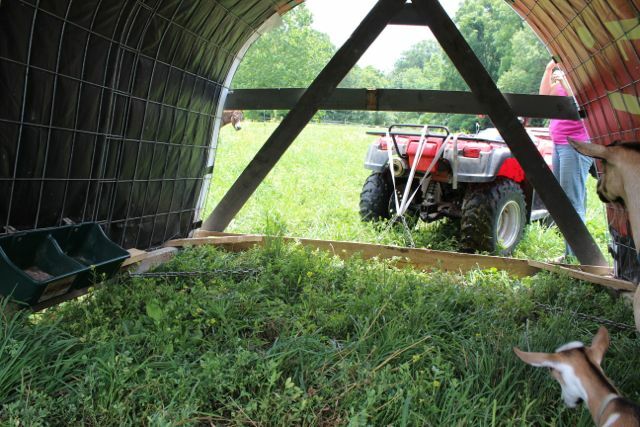 The other downside of a cattle-panel hoop house is that it is heavy. We used 2 panels, wood skids and supports, and a heavy duty tarp, and it weighs several hundred pounds. An upside of panels is that I can easily attach a mineral feeder under the shelter to keep the minerals out of the rain and still easily accessible to the critters. 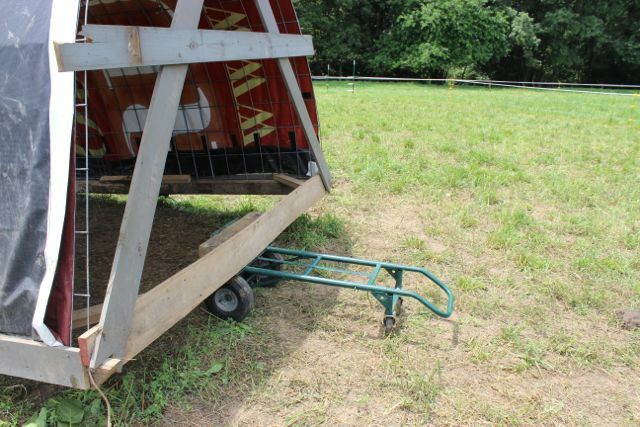 Because it is on skids, a draft horse could easily move it. Until we get our horse, though, we use the ATV for this also. There is another chain that loops to the dividing chain, and the second one sits under the front ground support board. You can see it above coming up out of the grass, just outside the middle of the shelter. I run the cargo straps through this chain, as close as I can. When I pull forward, the motion actually lifts the front of the shelter several inches so it slides easier over the grass. Now the shelter is on skids, so technically doesn’t need wheels, but we were worried about the back center board falling apart as it was dragged over the grass day after day, so we decided to use wheels anyway for the actual move, and just let the shelter rest on the skids when not moving. In order to do that, we use a standard household dolly with 4 wheels. We have a large block of wood that rests between the back board and the end of the dolly, to keep the weight and pull better distributed. Once everything is set up, I drive the shelter to the next paddock. As is usually the case, this is our first trial, and I’m confident there will be many changes as time goes on and we get better at this farming stuff. This is definitely not our long-term plan….we just don’t know what the long-term plan is yet, so this will have to suffice.